I made a simple meal that my wife loved tonight. I had half of a baked sweet dumpling squash leftover from a few days ago. I sauteed half of a package of tempeh, cut into cubes, adding a diced medium shallot a few minutes into the cooking, and the cubed squash a few minutes after that. When the tempeh was nicely browning after maybe 5-6 minutes or so, I added a fifth of a bell pepper cut into small pieces. About two minutes later, I removed the mixture to a bowl, mixed in a little salt, dried tarragon, and a tablespoon or two of a Key West Mojo Criollo marinade. I kept it warm in the toaster oven till I served. In the meantime, I prepared tricolor quinoa - it's so easy to cook this nutritious "perfect" food whose nutritional composition matches exactly what we need. I put in a measure (in this case cooking for two and a little extra for my daughter's lunch tomorrow, about 2/3 of a yogurt cup) of quinoa and twice that much water into a sauce pan, along with a vegan bouillon cube, brought to a boil, and simmered for 3 or 4 minutes, covered. I turned off the heat and let the quinoa continue to cook and absorb liquid till little liquid was left and the quinoa had the characteristic spiral shape. I served the tempeh and squash mixture atop the quinoa. Similarly to what I did in March 2009, I also broiled Belgian endives. I took two endives, cut them lengthwise into thirds, and lay the endive pieces on a plate. I chopped into long pieces a small shallot, and arranged pieces atop the endives, then sprinkled a little garlic-flavored extra virgin olive oil on top and broiled in a toaster oven for about 3 or 4 minutes till the endives browned a bit. I served with a little dried oregano, salt, and freshly ground black pepper. I teach a fun baby photography class as a childbirth educator at UNC Hospital, and had a session tonight. I often eat out when I teach at night, but came home right after class tonight. By the time we got my daughter to sleep and my wife and I took some time to talk, it was around 11:30p and I hadn't eaten. My wife had made something for herself, so I just had to get a meal together for myself. I love Vicolo pizza organic cornmeal deep-dish pizza shells. I used one of a pack of two while my daughter and wife were away last weekend, and decided to use the second tonight. I did a quick saute of a chopped Field Roast Grain Meat Company apple-sage vegan sausage in garlic oil (extra virgin olive oil with garlic flavoring), adding maybe a sixth of a green bell pepper cut into thin strips. 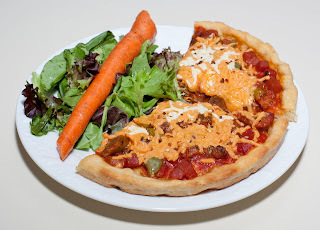 I mixed in some organic eggplant marinara sauce and topped the crust, adding cheddar-style (with a little bit of mozarella-style) Daiya vegan cheese, and baked in a 425°F oven for about 15 minutes, then served with a quick mixed greens salad with carrot. Dinner was fast (less than a half hour from beginning of preparation to eating) and tasty! I even had several slices for leftovers, and a small slice for my toddler's lunch box. My wife came home today with salad ingredients that I only occasionally buy, radicchio and Belgian endive. I decided to take advantage of the pretty radicchio leaf - most of us don't get enough bitter food in our diets, anyway. 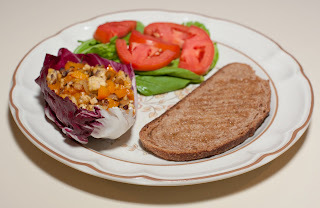 I made a simple saute of tempeh, bell pepper, and onion, and filled a radicchio leaf. A simple arugula and tomato salad, as well as toasted whole-wheat bread with garlic oil drizzled atop, completed the colorful and tasty meal. My daughter and wife are enroute home from a lovely vacation in Cape Cod, spending the day today in Boston. I ended up missing a nice trip, including my cousin's wedding, when I hurt my toe late last week. I've missed my wife and daughter, but they'll be back in a few hours! Today in the store, I found a new pasta, DeBoles' angel hair pasta with golden flax (gluten-free, made with brown rice) with golden flax. I've recently been craving a simple angel hair pasta with a rich but basic marinara sauce. No marinara today, but I whipped up a little pesto to top the pasta, and mixed some fresh tomatoes in. A grilled Field Roast Grain Meat Company vegan apple-sage sausage was a hearty accompaniment. Yesterday at the annual meeting of Weaver Street Market, they unveiled a new product. They make great breads and now will be making a new variety, rosemary sourdough with golden raisins. It's quite good - and I served a piece of it with tonight's meal. I often make uttapam, a South Indian crepe, for my daughter - it is her favorite dinner. So we almost always have batter around (I blend in our VitaMix blender rice and then lentils that have been soaking then let the batter ferment; I should post sometime details, including ratios, time to soak, time and how to ferment, etc.). I put vegan Daiya cheese on her uttapams - not traditional, but fun and interesting. I also put a little ginger and bell pepper. Tonight, cooking just for myself, I made an uttapam. The toppings I used were Daiya pepperjack vegan cheese, bell pepper, and shallot. It came out well! We were enjoying a nice playdate that was ending so another fellow Dad could go home and prepare dinner for his wife, when I suggested that she come here and that I make a meal for us all. So we had a nice meal with another couple and another toddler! I cut a box of seitan into bite-sized chunks and marinated in a Key West Mojo Criollo marinade. I started sauteeing over medium-high in Persian lime-infused extra virgin olive oil a medium onion cut into 1/4" half moons and one small diced shallot. As the onion started becoming clear in a few minutes, I added the seitan. In the meantime, I soaked a large handful of brown rice noodles in very hot tap water in a bowl and hand tore leaves from a stalk of chard and finely diced the stems. As the seitan started just showing signs of browning, I added the chard stem pieces. A few minutes later as the seitan browned more, I added the leaves, which I roughly hand tore into approximately 1/2" pieces. I drained and washed in cold water the now softened noodles. As the chard leaves cooked down in another two or three minutes, I added the noodles, stirred till they were cooked (about 2 minutes), turned the heat off, and mixed in a little salt, lemon pepper, and fresh basil and lemon sage from my garden (maybe 4 leaves of basil, cut into quarters, and leaves from about 1 1/2" length of the lemon sage). It came out very well! I also served corn-off-the-cob with juice of about 1/16 slice of Valencia orange, and a little Earth Balance margarine and salt. Multi-colored quinoa cooked with a vegan bouillon cube (2 parts water to 1 part quinoa, brought to a boil and simmered for a few minutes, then removed from heat and covered for 5+ minutes till the moisture was absorbed and the quinoa exhibited its characteristic spiral) and a small salad completed the meal. Our online farmer's market, Papa Spud's, delivered several delicata squashes and a few large sweet potatoes, so I got the temptation to bake them. I did just that in a 350°F oven, and threw in a few fingerling potatoes, as well. 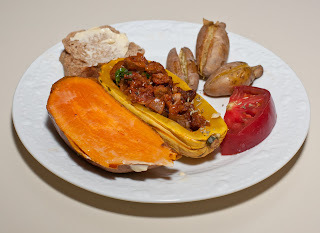 I baked the squash cut in half with the flesh face down in a plate with a little water. The small potatoes and squash were done in about 40 minutes, and the sweet potato took about an hour. I also cooked a stuffing for the squash by sauteeing, in Persian lime infused extra virgin olive oil, two vegan apple-sage sausages cut into 3/8" slices and then quartered and a shallot. When the onion was just carmelizing and the sausage was browned, I added a dozen or so baby spinach leaves and about a quarter cup of eggplant marinara sauce. After a few minutes when the spinach had cooked down, I added some fresh lemon sage from the garden, freshly ground black pepper, and a pinch of salt. We enjoyed the meal! I used a version of what I made to put together my daughter's lunchbox and hope she'll enjoy her lunch tomorrow. Oh, in her school, the children bake bread every Wednesday - that's her bread in the plate. It is a nice and slightly sweet bread.